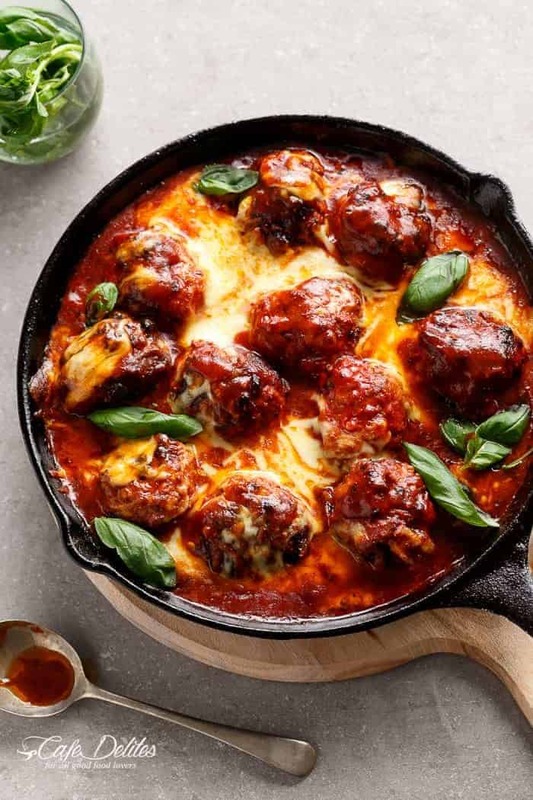 Tender and juicy Sun Dried Tomato Cheesy Meatballs (Low Carb) spiked with sun dried tomato pieces, garlic and fresh herbs, fried and simmered in a simple tomato sauce with so.much.cheese. All in one skillet! No one complained at the dinner table with this one. Or the dinner couch, if I’m going to be completely honest. Serve over pasta or Zoodles for a lower carb option. You won’t even miss the pasta. Those meatballs smothered in sauce are the hero. For these meatballs, I used a mixture of both beef and pork mince. 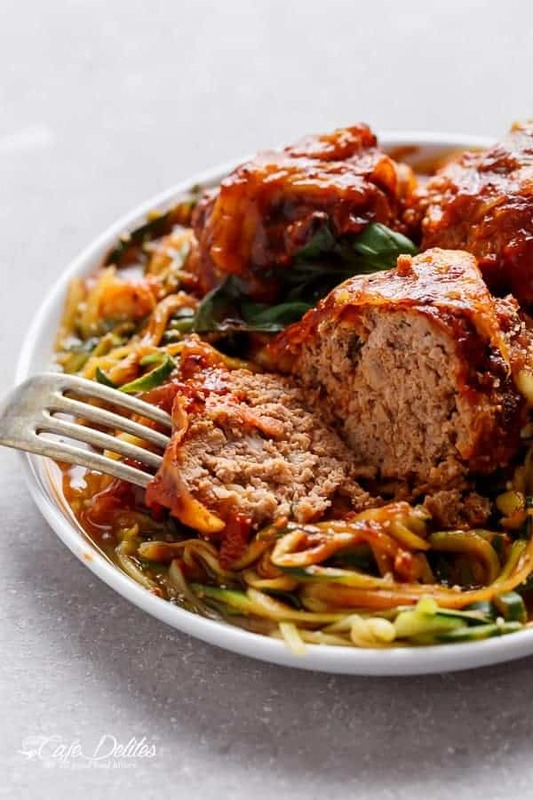 Something about that combination results in the most beautiful flavour and tender meatballs. Of course, you can use just beef, but I like to live my life on the edge. Combined with almond flour to bind them and keep them low carb OR you can use breadcrumbs if carbs are your thing. You know what the best part about these is? Bursts of sun dried tomato pieces in every bite. May have indulged in some trash tv on the couch in our pyjamas, slurping on zoodles and eating more meatballs than humanly allowed. This is one of those recipes you won’t regret. 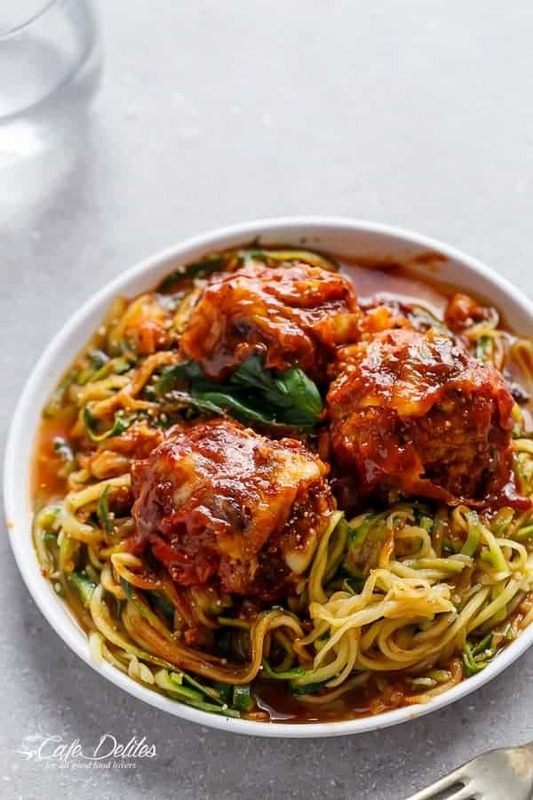 This recipe is right up there with those Creamy Chicken and Sun Dried Tomato Zoodles! 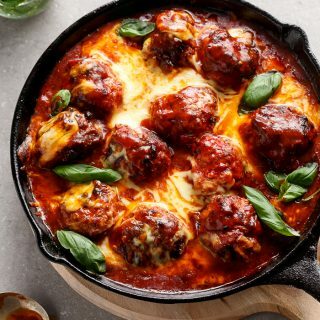 Tender and juicy meatballs spiked with sun dried tomato pieces, garlic and fresh herbs, fried and simmered in a simple tomato sauce with so.much.cheese. All in one skillet! Combine mince, egg and almond flour, tomatoes drained of oil (reserve oil), cheese, garlic, paste, oregano and basil in a bowl. Season with salt and pepper. Shape into 12 meatballs (I used full palm sized meat mixture). Heat oil in a non stick oven proof pan or cast iron skillet over medium heat. Cook meatballs, in batches for 3 to 4 minutes while occasionally turning to brown on all sides. Heat reserved semi-dried tomatoes oil in pan. Add the tomato sauce (or soup). Cook, stirring, for 2 minutes. 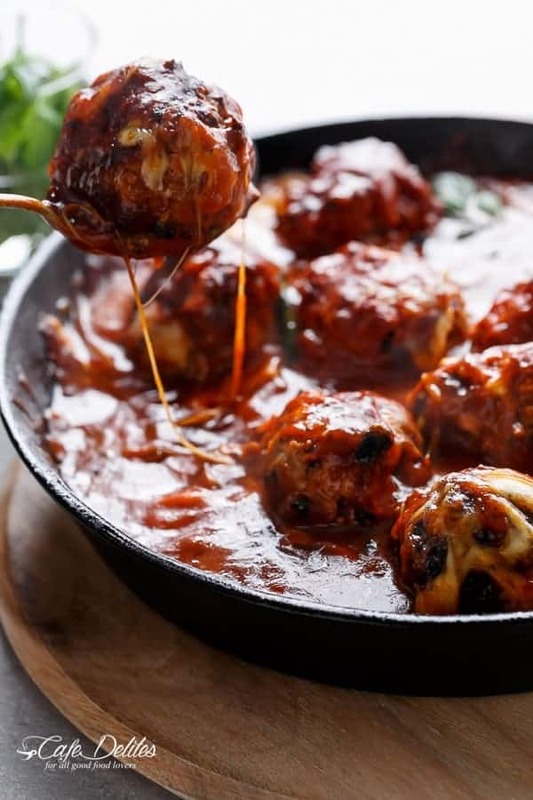 Return meatballs to pan; bring to the boil; reduce heat to low and allow to simmer, covered for 15-20 minutes or until meatballs have cooked through and sauce has thickened. Meanwhile, preheat oven to grill (or broil) settings on medium heat halfway through cooking time. 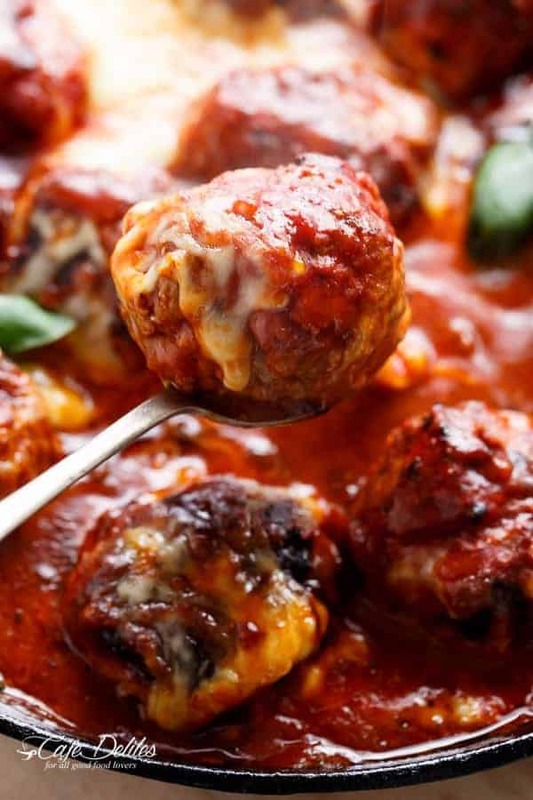 When meatballs are ready, arrange the bocconcini slices over the meatballs and place pan into the oven. Grill/broil until cheese has melted. I am eating this as I’m writing this comment! It’s really good! I have a few questions tho. I hit a few bumps while making this and I want to clear them up so I can make this again next time. 1. The dried tomatoes sold in US are pretty big slices. 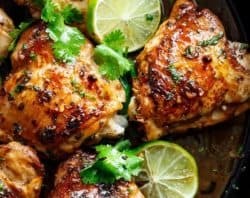 Do I need to cut them up in small pieces before adding them to the meat mixture? I ended up cutting them in smaller pieces but I wasn’t sure if I was supposed to do it. 2. After cooking the meatballs, there was a lot of oil in the pan. Was I to discard it and then add the dried tomato oil? I did discard the meat oil as it seemed like too much oil if I added tomato oil on top of that. Even then it seemed like a lot of oil. 3. Any advice on how to keep meatballs from falling apart while cooking them? 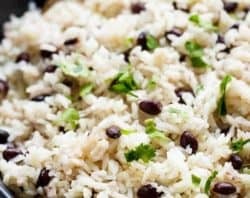 I really like this recipe and plan to make it again! where do you add the tomato paste? You will add the tomato sauce after the tomatoes are heated in the oil in pan. Add the tomato sauce (or soup). Cook, stirring, for 2 minutes. 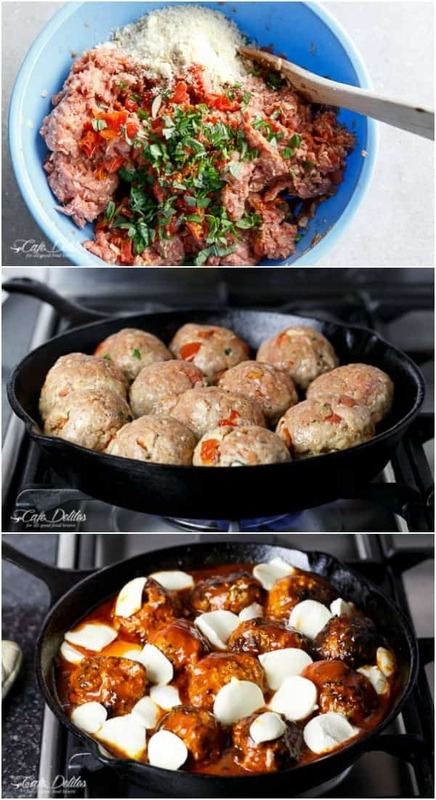 Hope that helps and you can make these meatball soon! OMG this is why Keto is going to work for me! Thank you for a keto friendly FAMILY pleaser! My kids ate LEFTOVERS! This is a phenomenal feat! Rock on! HAHA!! That is awesome! I am so glad that it is working for you and that you are loving the Keto recipes. Thanks so much for letting me know! These were amazing! So full of flavour. I did add some red pepper flakes, cause we love a little spice but other than that I wouldn’t change a thing! Thanks. That is so great to hear! Thanks SO much for letting me know! Love these! Have made them a few times already and the whole family loves them! Do you know if it’s ok to freeze the meatballs? 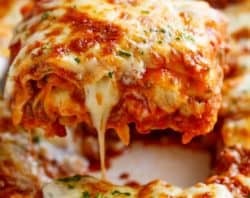 Again thank you so much for this awesome recipe ? 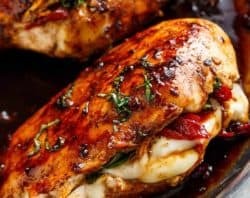 Just ran across this recipe and my mouth is watering for this! Can ‘t wait to try this. 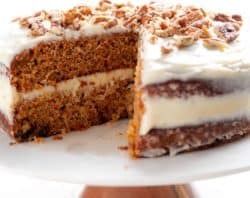 Thank you for sharing this recipe.? Well I can’t wait to try these when I can get home. We have already some of the meat to make this stuff. It looks so good to make even using some great already made dried pasta that is out there in the stores. so why wish to make these dishes that looks so good to make.!!!!!!! I’m so glad to hear that Lori Ann! I hope you liked it! I made this recipe a few days ago. There was one big problem with it…….I wanted more. Tonight I am making my second batch only doubling the recipe. This is so darn delicious. 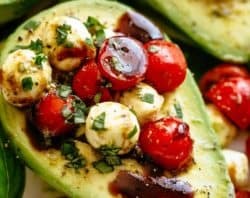 Thank you for the recipe and low carb alternatives. Liz I’m so happy to hear this! Thank you for coming back to comment. You’ve made my week! Made these last night and YUM. One of the more satisfying dinners I’ve had in a while. I made some tweaks: Used 1 jar marinara, and 1 1/2 cups of slow roasted tomatoes left over from our summer garden. I didn’t add the sun-tom oil because my meatball mixture added enough of its own oil, and here in the states we get 8 oz tubs of bocconcini containing 4 mozzarella balls, which was plenty. The sun- dried tomatoes added so much flavor. Hi Ginny! Wow sounds delicious! Thank you for coming back and telling us what you did. Yum!! OMG do these look great!! 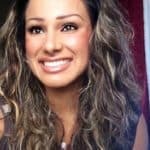 HI Karina Thanks for taking the time to calculate the points. Ill look forward to see what you get..
Hi Amie! Points have been calculated at 12pp per serve (2 large meatballs including sauce and cheese). I hope this helps! Hi Amie! I haven’t calculated this one yet, but I will do this weekend! These looks so stinkin’ good Karina! And awesome pics too. Yummmmm now that sounds incredible! Yes! That sounds good too! The possibilities are endless! 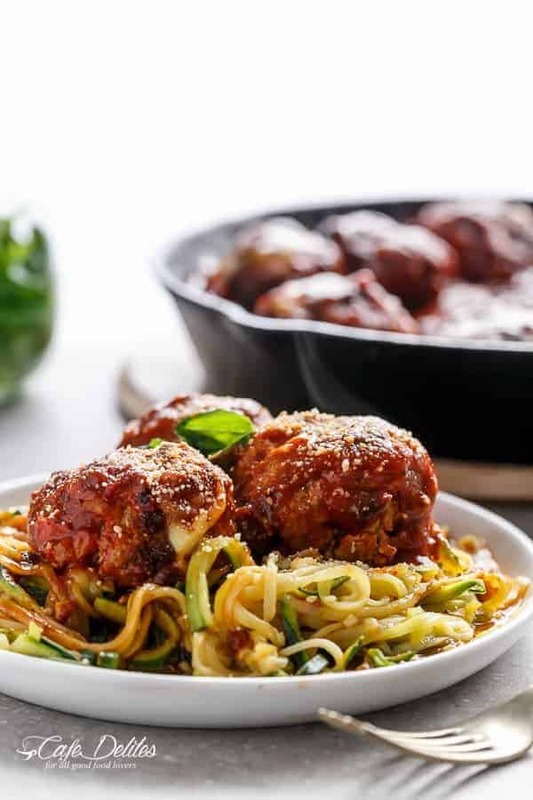 I’m loving that you put sun dried tomatoes in the meatballs for a little boost of sweetness. Loverly!